Showing results for tags 'mane'. 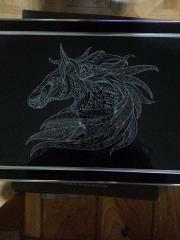 This picture is fragment of nice work piece decorated with Rainbow unicorn embroidery design 5. It is embroidered portrait of well known tale creature which often occurs in legends about beautiful princesses, medieval castles and brave princes. If you or your children like it you may use this picture for decorating your own work piece or thing prepared as gift for them. 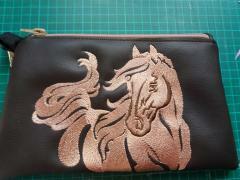 This is nice and beautiful little handbag executed for keeping cosmetics and little accessories. Its light background is decorated with some bright details. 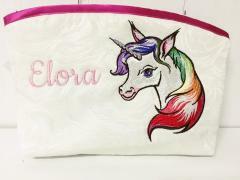 They are atlas border of intensive color and Rainbow unicorn embroidery design 5. 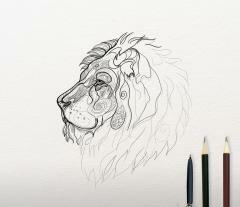 Pretty portrait of legend creature reminds about favorite tales from your childhood. 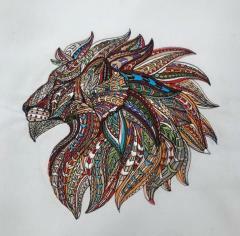 Front side of this work piece is added by name of its owner. This is original and interesting sweater in youth style. It has gentle shade and unusual style which makes it very convenient clothing. 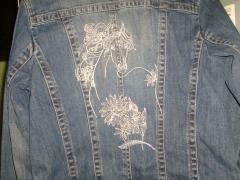 But it is also stylish one due to Pure friendship embroidery design. On this picture you may see big gorse and little girl. They are so happy together. This heartwarming picture is added with name of this sweater’s owner. This is cool embroidered picture which shows original taste of its author. It is unusual portrait of animal’s king: head of lion is executed in interesting manner which reminds mosaic. Each element of this sample is well elaborated part of whole picture. 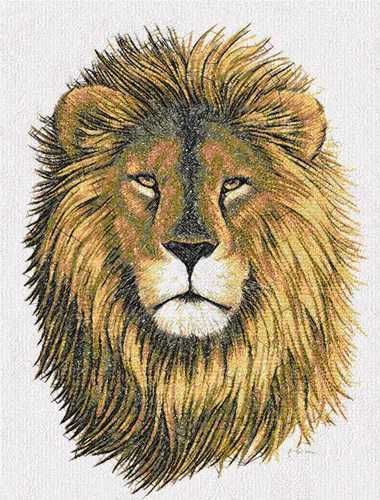 Mosaic lion embroidery design is quite complex composition which can embellish any work piece where it is used. This pretty terry towel is good example of transformation of usual thing into original and unique work piece. 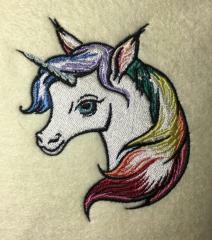 Author used Freckled unicorn with toy embroidery design for this towel. Due to this beautiful embroidery sample this thing can be taken in swimming pool or school without any chances to lose it. Everybody will know who is its owner: there is her name on it. This is pretty set for good sleeping of little child. It includes three items: they are soft little pillow, comfortable sheet and warm light blanket. 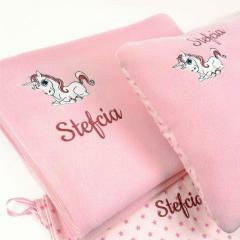 All of them are decorated with name of its little owner and Unicorn machine embroidery design. It is pretty picture of tale character with beautiful blue eyes, fluffy mane and magic horn on its forehead. A fleece jacket is an indispensable thing in any wardrobe. This is practical and comfortable clothing. 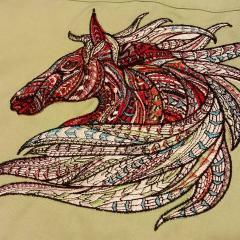 And thanks to embroidery such a jacket can become the most favorite, because as an embroidery you can choose design with your favorite animal, for example a horse, as in this variant. 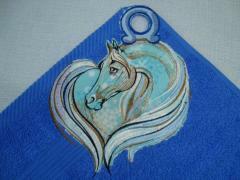 Find this design here: Horse heart free embroidery design. Now in the stores you can find absolutely all, any thing. 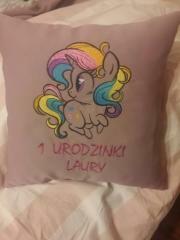 But to make the thing exactly YOUR, to fill it individuality, to give it uniqueness - for this you can use machine embroidery. For example, an ordinary bag for shoes. There are millions bags in stores. But if decorate bag with embroidery, you will never confuse such a bag with other bags; you will recognize it always and everywhere, because the other such bag is just no. 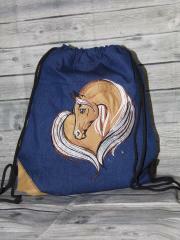 Find this design here: Horse heart free embroidery design. On our forum you often enough see the design of "Horse heart". This is a calm, but at the same time very interesting design embroidery. In the depiction of the horse you can see the contour of the heart, which allows you to interpret this embroidery as - "love of horses." It seems to me that this embroidery design is more suitable for women. 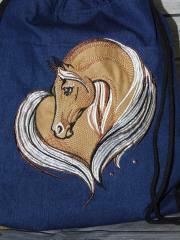 Find this design here: Horse heart free embroidery design. This is interesting sample which shows original image of horse. It is kind of portrait executed in mosaic technique: each detail of its head is made from little elements which create great entire picture together. 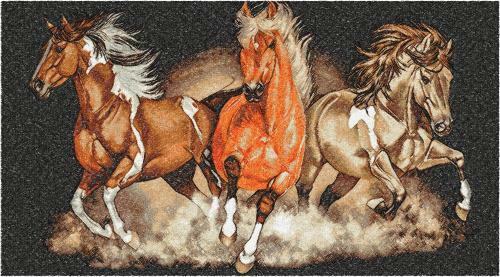 Mosaic horse machine embroidery design is amazing combination of clever composition of many little details and sense of freedom which you feel whne see horse with waving mane. Sample is available in five different formats.